We Do More Than Just Fences! Serving the greater Chicago area, First Fence Company designs and installs attractive, long-lasting residential fences and commercial fences made from the highest-quality materials available. Choose from more than 100 styles as we work with you to create a fence that complements your style and budget — all while providing exceptional service along the way. At First Fence Company, you’re never just another customer — you’re an individual who matters to our team. We ensure we give you the best possible fencing solutions and services by taking the time to get to know you and your needs. Once we understand the specific look, feel and function you’re envisioning for your fence, we’re better able to help you make the smartest choices for your materials. In fact, we not only provide quality residential, commercial and specialty fences to the Chicago area, but also first-rate fence installation services. As the Chicago area’s vinyl fence installation company that both supplies and repairs fencing structures with superior skill, we design, install and repair wood, aluminum and vinyl fences throughout the Chicago area you can trust. That’s why, when you pick your fence from us, you can always be confident you made the best decision. At First Fence Company, we’re intentionally selective about the fencing products we use because we only offer craftsman quality. All of our consultants and installers have an incredible eye for detail, finding and providing the finest materials in the industry. From high-quality wood to custom vinyl fences in Chicago and the surrounding area, we create the kind of fences that clients love. Come to us for custom-designed wood fences, chain link fences, aluminum fences, or vinyl fences throughout Chicago that’s just right for your needs and budget! Regardless of the fence style you choose, with First Fence Company, you can rest assured it will be built to the highest standards. We’re the vinyl fence company in the Chicago area that’s always here when you need us. When we’re working on your project – whether it involves ornamental steel or vinyl PVC fences – you can also count on the fact that we communicate with you. You’re never left wondering when your job will be done or what is going to happen next. You always have our attention. From beginning to end on your project, we remain open, communicative and friendly throughout the process. When you want a quote, have a question, or need repair work done on a fence, you can easily and conveniently get in touch with us – just contact us any time during business hours for a fast response. 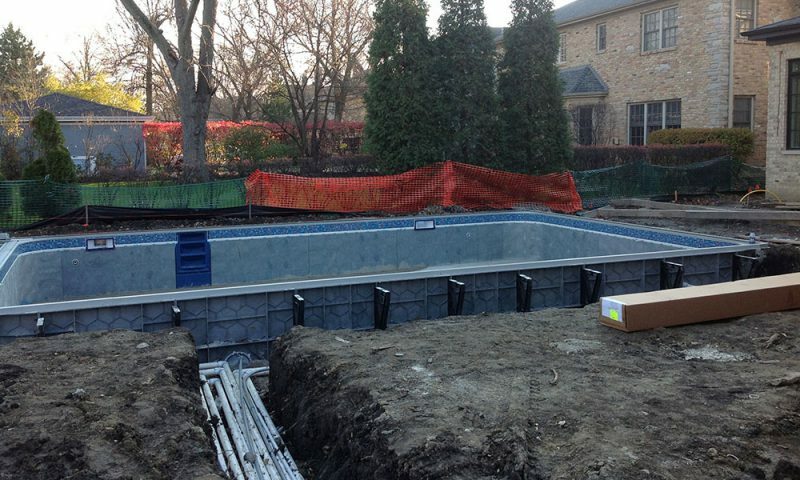 The Chavez family was building a new home, and contacted First Fence because they wanted additional privacy and safety for their pool. We installed a stained black horizontal fence, which features an aluminum front section and entry gate. We rely on the most trusted name in architectural metal fencing. Bufftech vinyl fence is made with carefully selected ingredients designed to increase durability and long-term performance. Long-lasting PVC and vinyl fences in an array of elegant styles. D&D sets the standard for secure, easy-to-use fence hardware. Economy Iron designs, and builds ornamental iron to last a lifetime. Our metals and coatings are chosen first for their endurance. Our high-performance EverGuard® vinyl fence systems are recognized for their long-lasting durability and beautiful design. Premium materials for industrial, commercial, and high-security installations. Enjoy the look of wrought iron fencing without the cost or upkeep. Manufacturing your vinyl fence materials since 2004. For lightweight aluminum fencing with the look of iron, choose Ultra. Our easy-to-build railing kits provide safety and high quality at a more reasonable price.